I have become a self-proclaimed “farmer”/cave girl/old lady and frugality and DIY projects are suddenly fascinating and exciting. I know, my life is just too full of action and excitement. But you know what? When the world ends and the supermarket is suddenly empty, I can take a chicken and make you a yummy dinner AND some lovely stock. Want to be awesomely prepared like me? Love food, hate waste! 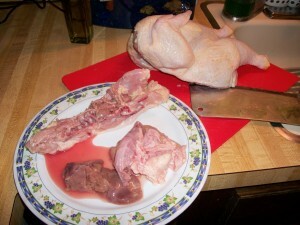 Begin by taking your lovely chicken spine and “brown bag of horror” out of your chicken. Even if you aren’t butterflying your chicken, let’s be honest: no one eats the spine. Just take it out. 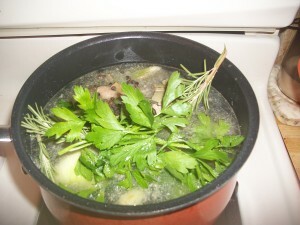 AND it’s full of yummy goodness that will infuse your broth with flavor. 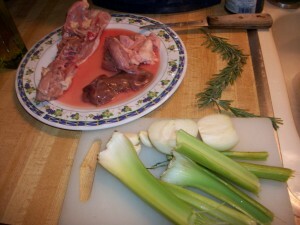 There are many things to you can do with the chicken’s insides, none of which I am overly familiar with, but using them in chicken stock is a great way to use them without wasting them. 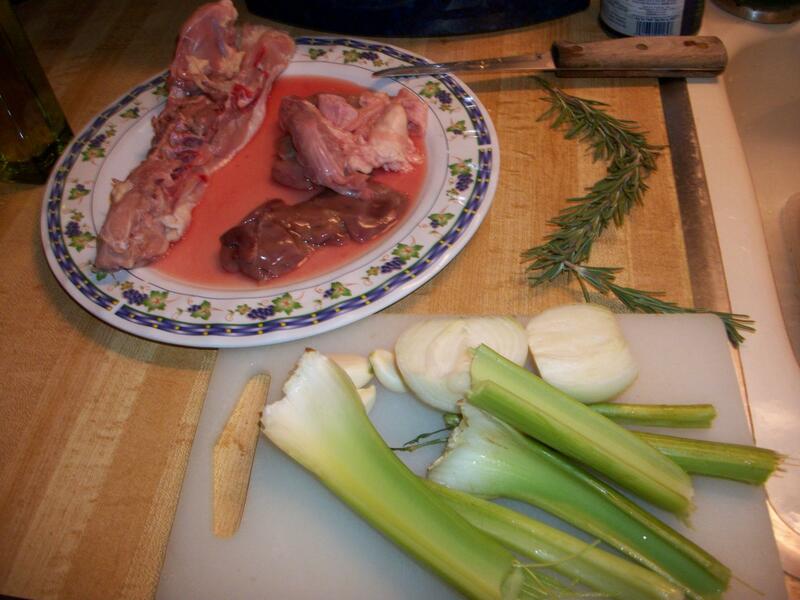 A typical chicken broth starts with a mirepoix (onions, celery, carrots) but because of Paleo’s ill-will against carrots, I just left them out. Also, if you have any fresh herbs in the house – toss those in too. Begin with a medium-large sauce pan. Heat olive oil over medium-high heat. 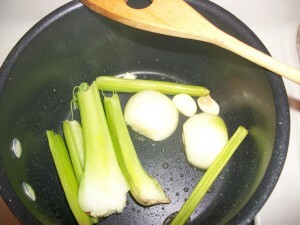 Saute the onions, garlic, and celery until slightly soft. In this step, we are aiming to extract some flavor from the vegetables. This will take anywhere from 4-8 minutes, depending on how big you left your veggies. I just gave mine a rough cut so they would fit in the pot. While your veggies are softening, raid the refrigerator and cabinets for any spices to add. 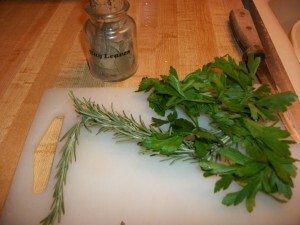 I happened to have some fresh parsley, fresh rosemary, and dried bay leaves on hand. We are going to eventually strain the stock, so feel free to leave everything whole. Less work = more time to do anything else. After the veggies have simmered for a bit, toss in the chicken spine and insides, stirring occasionally. 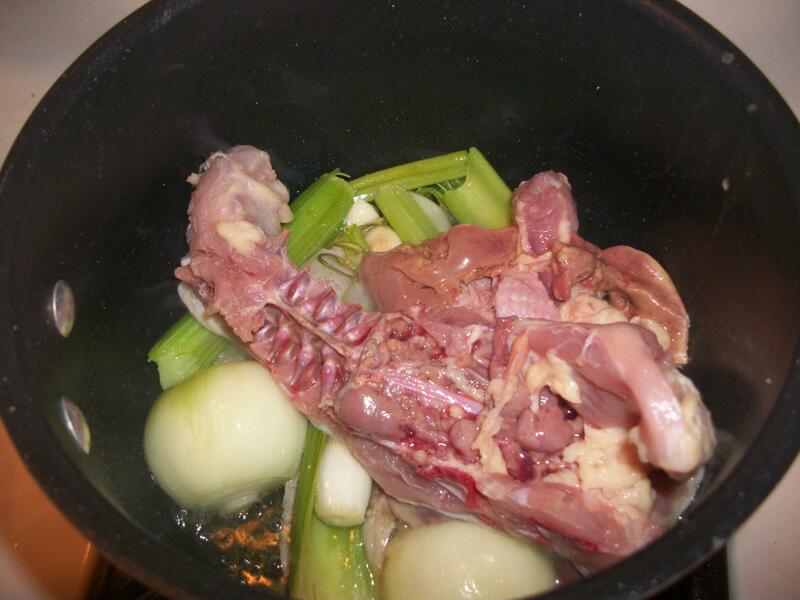 Get a slight cook on the outside of the spine and insides to further season the pan before we add the water. Add enough water to cover the chicken and throw in the spices. Don’t forget salt and pepper! There’s nothing worse than a bland stock. I like to use whole peppercorns, well just because I haven’t had a use for them otherwise. Bring the water to a rolling boil, turn the heat to low and cover. There is no strict time limit because you can boil it for 1-2 hours or all day. 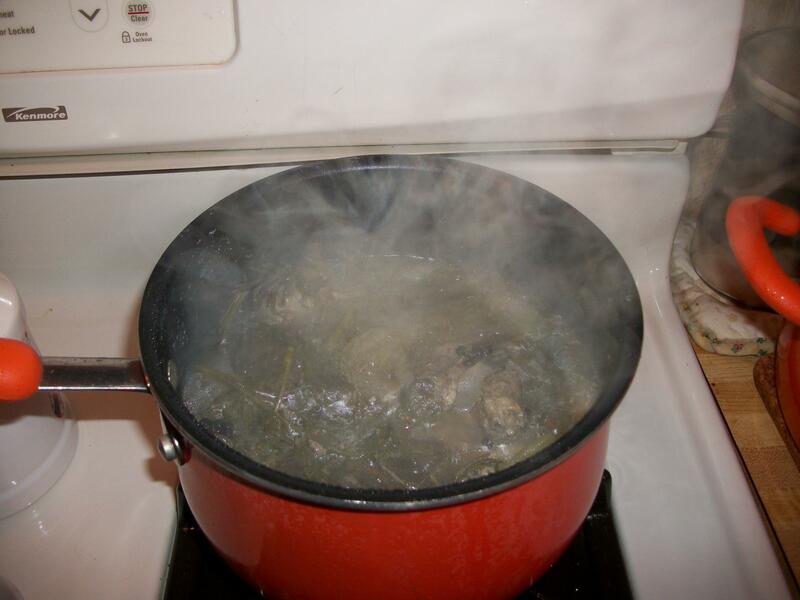 The longer the water boils, the more flavorful the stock. If you are going to boil it all day, be sure to check your water level and add more if needed. Once you’re satisfied with your cooking time, remove the pan from the heat and let cool. Using a strainer (or, in my case, a splatter screen) pour the liquid into an airtight container. You can store this in the refrigerator for a few weeks, or freeze it for future use. 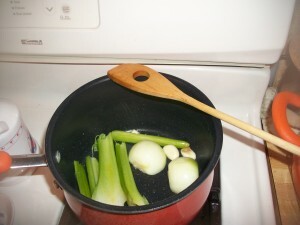 I love this stock because it eliminates waste and tastes amazing as an addition to soups and meals. 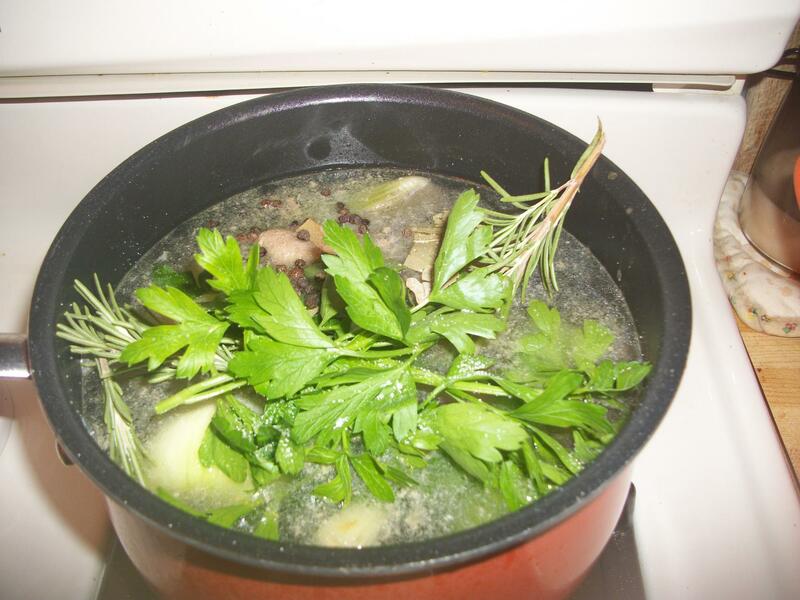 Once you’ve had homemade stock, the store-bought stuff is never as good (or good for you! ).